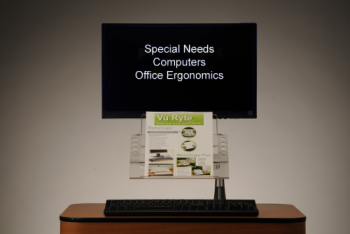 Vu-Ryte solution to the Sit-Stand Dilemma! The world's first document holder designed specifically for use with monitor arms, the VUR 59GR offers a sleek and efficient profile to help you maximize your workspace. Whether employing Sit-Stand or not, the VUR 59GR is a revelation for ergonomic efficacy. Adjustable in height, depth, and angle the VUR 59GR accommodates documents of almost any size! 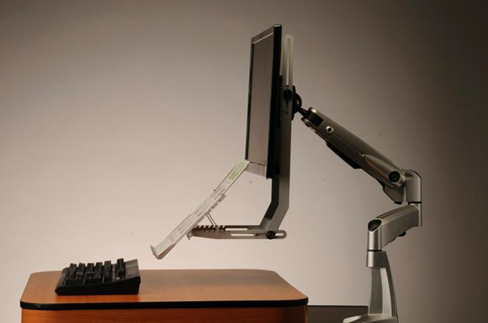 Don't wait - turn your monitor arm workspace into an ergonomic giant! Paperflow is alive and well in offices across the country, and that can be problematic. 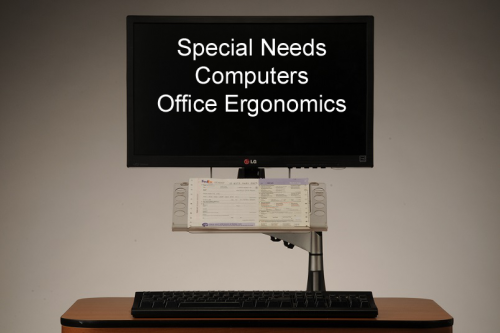 Because while many office workers take into account their desks, keyboard trays, monitor arms – even their mice and keyboards – when setting up their ergonomic workstation, they don’t often anticipate what to do with paper. More often than not, reports and other paper materials get placed flat on the desk, forcing users to crane their necks down to read them, straining the neck and shoulders in the process. Standard document holders keep these reports at an angle, but are unable to hold them at an ergonomically-sound height. Even users who rely on monitor arms don’t get to reap their benefits when forced to stare at a sheet of paper on their desk, tilted their entire heads up and down between paper and screen instead of just shifting their eyeballs. This is where Vu-Ryte’s new document holder, the 59GR, comes in. This doc tray attaches directly to your monitor arm, keeping your reports as close to that eye-level ergonomic sweet spot as possible. Users who transpose a lot of information from paper to computers in their daily work should also see a slight productivity improvement. The 59GR arrives in a flat box and consists of a back plate, vertical support arms, and a base with arms to attach to the easel and easel lip. The components themselves feel somewhat flimsy – sparkly gray light metal aside from the plastic easel and easel lip – but are sufficiently rigid during assembly. The 59GR is easy enough to assemble and install. It’s put together using a set of thumbscrews and does not require any special tools. Installing it to your monitor arm requires you to remove the top two screws on your VESA plate to slip the 59GR between the VESA plate and the monitor, and and replacing those screws when done. Altogether, you’re looking at spending around 15 minutes putting the 59GR together. Vu-Ryte Adjustable Depth and AngleIn addition to its placement underneath the monitor, the 59GR boasts some impressive adjustability. Eight and a half inches of adjustable height, five and a half inches of adjustable depth, and seven easel angle settings ensure that you can find the most ergonomically comfortable position for yourself. Adjustment requires loosening the appropriate thumbscrews and sliding either the vertical support arms to adjust height or the easel arms to adjust depth. The lip of the easel is detachable and can be hooked onto one of four pairs of holes to adjust the easel’s vertical size. The 59GR isn’t width-adjustable, so while the 12-inch long easel can easily accommodate letter-size documents, those who use legal-size or larger will find it a little cramped. We’re fans of the ability to swing our monitor arm to the other side of the desk and having whatever documents we need right there. However, you may need to reorient your workspace to accommodate your new office add-on. The 59GR can’t be tucked away when not in use, making it a functionally permanent monitor arm attachment, and that means you’ll be working with a sparkly piece of metal below your monitor all day. We attached the 59GR to the ‘tall pole’ version of Ergotron’s LX monitor arm and were quite satisfied with the results, but would recommend users to make sure they’re able to fit a letter-sized sheet of paper under their monitor before considering the 59GR. What’s more, the easel isn’t a completely solid piece – there’s enough empty space that you can’t use it as a writing surface. A simple hack to bypass this is to set a small white board or other hard backing on the easel and write on that. The Vu-Ryte 59GR is a fine document holder for transcribing deskers who want an ergonomic solution to their paper needs. Its adjustability and ease-of-use make it a viable office add-on to complement your other ergonomic peripherals and complete your active workstation. Note: Certain monitors have recessed backs and might require longer than standard screws for installation. Please call 1-877-724-4922 if you might need these screws.